There are many reasons that a patient can become limited in mobility. Common instances include a disability, aging individuals and those suffering with bariatric conditions. A transfer refers to the movement of an individual from one specific place (or surface) to another. The purpose of this article is to help you understand the safe processes of patient transfers and how best to protect both the caregiver as well as the patient during these moves. It is important to understand the importance of choosing the most efficient and safest method of patient transfer with regards to both equipment, training and procedure. Each patient will have a unique level of independence. The patient’s level of mobility may vary greatly. Some individuals maintain some independence of movement, while others are fully dependent on the caregiver and medical equipment. In all instances, the role of the caregiver is vital and adequate education on the safety measures of patient transfers is important in all instances. The role of the caregiver is vital in these transfers and safety is the utmost importance. It is imperative that Home Health Care Agencies train their employees on how to do safe transfers. This is paramount to all caregivers since almost 75% of the caregivers need to transfer multiple times each day. This wear and tear on the back, knees, neck and arms can cause damage if not done properly. Education is the key in transferring clients from point A to point B. It is always best if there is the ability to transfer your client from a side entry. Front entries such as wheelchairs that do not have removable arms, or Lift Chairs, will be a front entry transfer. This means that the client will need to get their hips above their knees to a somewhat standing position to transfer. How can the Caregiver, whether it is a family member or home health care company, remain safer during these day long processes? Never bend at the hips first! You are to bend at the knees, keep your back in an upright position, and use a padded gait belt (or something similar) to help you to get their hips above their knees. Place the wheelchair next to the bed with the brakes on. Remove the arm of the wheelchair or flip it back for an easier side entry. Lower the bed as far as you can to reach the level of the wheelchair. Use one swoop move to transfer from the bed to the wheelchair. If your client cannot stand, it is always best to raise the bed up first so the hips are above the knees so the transfer can go smoothly. You can guide the patient to the place you need them to move by making sure that all equipment is set in place prior to the transfer. The time you invest in the safety of the caregiver, not only helps prevent injury to the caregiver, but also to the patient or family member. Many times the caregiver is a family member. If you are the sole caregiver or transfer your loved ones many times a day, just think of the consequences if you get injured. The costs to bring in a caregiver to the home many times, is not feasible. Invest in the time to go to your local provider for some consultation in transfers and the tools that will best help you in your situation. Affordable Medical Supply offers this consultation and has educated many families n safe transfer procedures. During the time of the transfer, the individual’s safety is of utmost importance. The patient’s movement needs to be controlled and fully supported. A key observation when transferring a patient is to maintain the center of mass. The caregiver is often required to be close to the patient’s center of motion which is normally between the shoulders and the pelvis for optimal support. Understanding the patient’s limits of stability will help evaluate their balance. When moving a patient from the bed to a chair (and vice versa), try to minimize the distance between the two locations and make sure that the patient makes contact with the surface before sitting. Small details, such as the patient wearing non-slip socks, can make a big difference. Additional key considerations for the chair include the seat height, seat depth, seat width and leg elevation. All of these details will determine the patient’s safety. There are a variety of medical equipment that’s available to assist with the safe transferring and handling of patients. 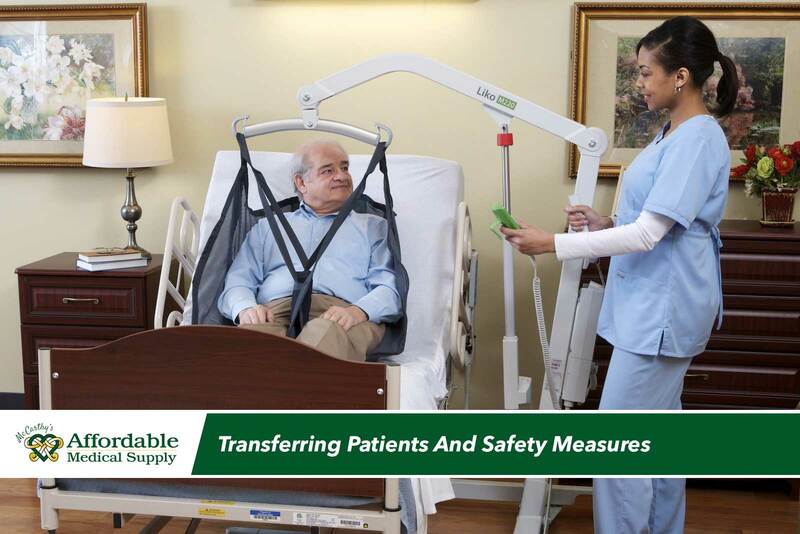 These include Hoyer® Lifts, transfer kits, and full electric patient lifts, all of which offer additional support for the caregiver and the patient. Remember, prioritizing the safety of both caregiver and patient reducing injury and possible workers compensation claims. There are important factors to consider when purchasing or renting equipment for patient transfers. Most people make the incorrect purchases and wish they used a consultant to help them determine their immediate needs as well as the needs of the caregiver and patient as their ability to transfer independently diminishes. 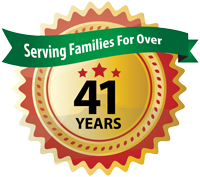 Affordable Medical Supply has over 41 years of experience, education and understanding of diseases and conditions. Our focus on caregiver’s education and safety has awarded us with the respect of the many other healthcare professionals. We invite you to come to our large retail store, see the equipment, learn about our rental equipment options, and meet with the staff in our private conference room, and see how we can help you in your personal situation.